The average ring size for a man, by the way, is a 10, so if you are an average-size man (average medium frame being 5'10" with a weight of 180 pounds) with average-size hands, you may be able to use your own hand for comparison. If her hands are a lot smaller than yours, she may very well wear a size 4-5 on her ring finger. Be aware though, many men lose their wedding bands because their bands are too loose. If you are not used to wearing a diamond engagement ring or a wedding ring, the correct size may feel tight at first. We'd like to point out however, that EVERY woman is different, and there are no guarantees that figuring out her body type will correctly determine your girlfriend's ring size. So, we don't strongly advise going with this option. Ladies ring sizes can be as small as 4 and go up to a 10, so there's lots of room for error using this method. To play it safe, you could order the ring at a size 6 or 7, and present it to your girlfriend. 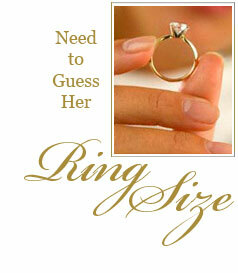 She can then determine the correct size she needs, then return it to us and we will resize it once for FREE. Please note that if you order a size 6 or 7 ring and you choose to have it resized to your "guessed finger size", this counts as the 1 FREE resizing. If you have not guessed correctly, and it needs to be sent back, there will be a $25 charge for the 2nd re-sizing. Keep in mind that some of our fancy diamond rings, because of the way they are made, may not be easily re-sized. (Our rings with diamonds all the way around, are a good example). It would be very important to order one of these diamond engagement rings or wedding rings in the correct size. Please feel free to call one of our expert jewelry consultants at 1.877.404.RING if you have any doubts or questions about your order. If you regularly buy jewelry for another person such as your girlfriend, wife, daughter, etc. we've created a nifty Hand Chart that will help you keep track of her different ring sizes. This way, you will never have to ask her in the future, what ring size she wears! Download a PDF of our Hand Chart for all ring sizes. If you are not able to download and printout this chart, you can easily create one yourself. Have her trace the outline of both of her hands on a piece of paper. On each finger outline, have her write-in her correct finger size. You can use the FREE ring sizer from Danforth Diamond to size each finger. Because fingers are not always the same size on each hand, be sure to do BOTH hands. Label them Left and Right and put her name at the top, along with the date. (Finger sizes can change over time due to age, weight gain or loss, and climate. So you may want to re-examine or update this hand chart every five years. File it away in special place, and you'll be ready for every special occasion! Create a hand chart for all the important women in your life! Now that you have the correct size, start shopping our collection of diamond engagement rings and wedding rings.